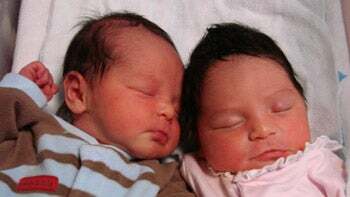 Twins Nathan and Natalie Barbosa are completely normal, healthy babies, but their birth last week was extremely unusual. Andreea Barbosa of Florida has two uteruses, or uterus didelphys, a condition that can lead to infertility. She already has a two-year-old daughter, and her doctor thought a double pregnancy was essentially impossible (though it isn't unheard of). Yet, Barbosa managed to conceive in both uteruses at the same time. Barbosa says she and her husband aren't planning to have anymore children. "The first pregnancy I had one, the second I had two," she explains. "I can't risk having three the next time." A Michigan woman with two wombs has given birth to twin daughters, one from each uterus.